Entertainers and walkers represent an important part of a baby's playtime as they take part in exercising their limbs, learn cause and effect and develop their co-ordination skills. 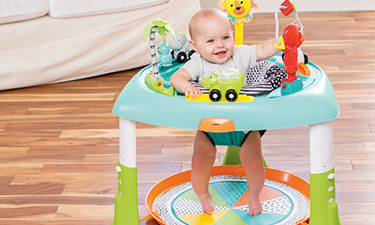 The most popular baby entertainers are the stationary ones that provide a secure place to leave baby in, and give baby a 360 surround of toys at eye level. Most have a swivel seat encouraging baby to keep moving themselves around tempted by the next toy, whilst overhanging toys encourage them to bat and grasp as they jump up to reach them. These are fabulous high value toys to offer for safe early physical and cognitive development. Door bouncers provide a more affordable, traditional option, but without as many toys to engage and ideal for smaller spaces. At Baby Brands Direct a choice of leading brands are available to trade at finger tip reach including Fisher-Price, Bright Starts and Summer Infant. Walkers support and encourage those early steps and are available in a variety of formats from friendly plush pets, electronic talking toys to play role activity centres. Entertainers and walkers sell very well for many reasons. Firstly, parents buy them because they are easily portable and guarantee the baby is safe while allowing the parent to rest. Secondly, they are engaging for the little ones, combining several whole-body activities that combine multiple senses in play. For instance, entertainers or also called activity centres allow baby to bounce, walk/spin around, use their hands to manipulate little toys, and learn cause-and-effect relationships. Parents also find them to be a good investment because the latest items can be adjusted as the child grows thus prolonging the product life cycle. According to paediatrics walkers are a fantastic way to stimulate child’s movement as it helps strengthening the right muscles for walking. Baby Brands Direct clients can choose from a variety of activity centres and walkers from leading nursery brands.